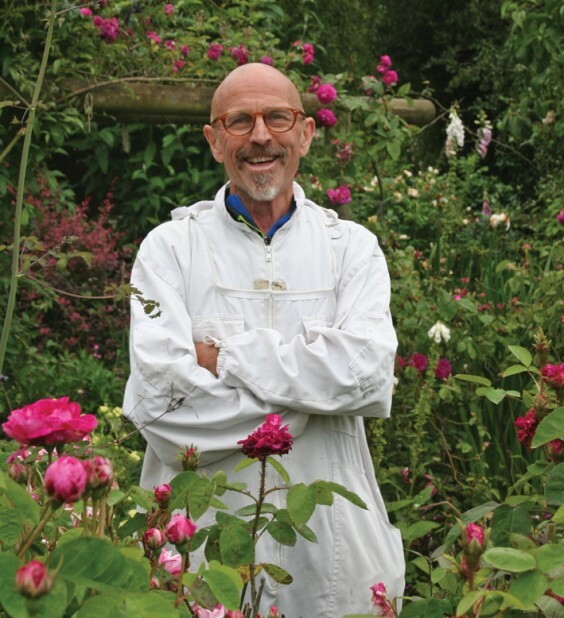 I’ve been meaning to interview John Adams about his garden, and particularly his wonderful collection of roses, for ages. John and his partner Mel live in the lovely hamlet of Withybed Green, just on the edge of Alvechurch. They open their garden to visitors every year, either as part of the Alvechurch Open Gardens scheme or the NGS (National Gardens Scheme). Although John can get some colour in the garden from May to November with the amazing variety of roses he has, late June to early July is the best time to see this garden. I spent an early evening with John, chatting about gardening, roses, pushbikes (we are both keen cyclists) and bee keeping. John and Mel have about a one-acre plot with approximately one hundred and fifty different roses in it! The style is very much ‘“cottage garden”, informal and rambling, just the sort of thing I love. All the roses are shrub, ramblers or climbers; they are often called “old-fashioned English” roses, and many have an interesting history attached to them including how they were bred, by whom and when they were first available. If you have the right conditions they are easy to keep and look fabulous when allowed to ramble through beds of cottage garden perennials like foxgloves and geraniums. So not a floribunda or hybrid tea rose in sight. The testament to John’s method working really well is the amazing number of flowers and buds on all the roses in his garden. He also keeps feeding to a minimum, just a handful of blood, fish and bone when he remembers. It is worth noting here that John’s garden is heavy clay – just to give you an idea of how heavy, Alvechurch had a brick works in the past. But roses love this sort of soil once they have their roots well down into it; a clay soil will hold its nutrients well and won’t tend to dry out as readily as a sandy soil. John and Mel’s cottage is situated at the end of a private lane, and along the lane there are plenty of roses edging the tarmac drive. The front garden has oval-shaped beds full of roses. This was the first part of the garden they created. Go through the archway at the side of the house and the back garden is just a picture: winding grass paths around borders crammed full of roses, foxgloves, geranium ‘Johnson’s Blue’ and unusual perennials. A wonderful old lavender that straggles the wall near the house was a plant rescued by Mel more than 25 years ago. The meandering paths take you around the garden, and at the back is a little gate to the field and overhead an archway with the rambling rose ‘Paul’s Himalayan Musk’ in full bloom – this was the first one John planted. Little seating areas are set out to enjoy the different elements of the garden, its views, a little pond and of course its roses. The rear section of the garden is about five or six years old, leading up to the beloved bee hives. A long pergola structure gave John more room to add climbing and rambling roses, along with some beautiful clematis. A well-tended vegetable patch on the left and a newly-planted orchard – all local, heritage varieties – complete the picture. The light was perfect on the evening when I wandered around taking photos of this beautiful garden, and I was thinking about what makes this place special. It’s not only the large collection of roses, which are impressive (and John has extensive knowledge of them; ask him to name any and he can), it is also how well he knows this plot. The soil and how to work it, the microclimate in this particular location on the side of a hill, how all the plants work together and when they are in flower and at their best. . . this is what I would call expert gardening.